Sheep producers need to step up their efficiency and market their lambs long before the end of the calendar year if they’re to maximise their overall returns, and avoid the impact of New Zealand imports, according to Jim Findlayson. 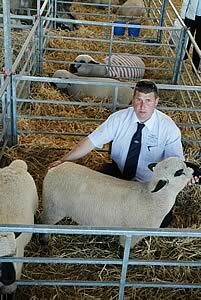 “For best margins, lambs should be finished purely off milk and grass to hit the market in June and July,” he says from experience having made his first draw in mid June; it comprised over 20% of his crop of Hampshire Down cross lambs at just under 12 weeks to average 18.7kg deadweight, with 35% grading in the U bracket and the remainder, R. The lambs were sold exported, at a premium, to mainland European markets. “With the seasonal New Zealand trade commencing in December, one month earlier than previously accepted, we really can’t have a repeat of last season when lambs were stored and then fed over the winter in the hope of a better price. Costs soon racked up with creep at an average 10p per lamb per day, plus labour and accommodation,” he said. Jim speaks from both sides of the fence. Five days a week he works as a lamb procurement officer for Lawrie and Symington, visiting up to 40 farms a week and selecting more than 55,000 head of prime and light lambs, store and breeding sheep annually. Eight years ago he realised an ambition to farm with the purchase of Old Cluden, Irongray, near Dumfries, a 106 acre LFA holding together with 100 acres of nearby tenanted grass carrying 320 Mule ewes and 80 hoggs, together with 80 head of cattle. Jim’s father, also Jim and a former fieldsman with the same company, provides an additional pair of hands. “We’re sheep men through and through and wanted to maximise output of finished lamb as efficiently as possible from our own resources,” he said. “Our first job on arrival was to start reseeding the entire unit. Since then, we’ve ploughed up and sown high digestible, high sugar content varieties which we believe have contributed to faster growth and the lambs finishing two weeks earlier. “To make further improvements, we realised we had to change our genetics. We’d already stocked with top end Mule twin ewe lambs; they’ve proved to be great mothers with plenty of milk, they’re hardy and prolific and we wouldn’t swap them. So we decided we’d have to look at our tups. The risk paid off. “The speed at which these lambs are finishing is tremendous. The first draw of 77 Hampshire Down cross lambs had reached target weight and were away before three months of age, and the majority were twins,” he explained. “We’d be used to starting the season with less than 30 Continental crosses ready to go at 16 weeks and they tended to be the singles. At this rate the entire crop of Hampshire Downs should be away off grass, which will bring considerable savings of more than £1,000 to the creep bill. “Also by hitting the market earlier we received a £5 a head premium over lambs marketed four weeks later. We hope the historic June market will return when an 18kg deadweight lamb sold to average up to £10 a head more,” he says. Jim Findlayson says he’s also benefited from the Hampshire Down’s native traits. “The lambs were great to lamb, they didn’t need any assistance and were born with tight skins. They proved to be lively and were up and away sucking immediately, turned out within their first 48 hours and since then they have continued to grow away without any checks.” The flock achieved 195% lambs reared.